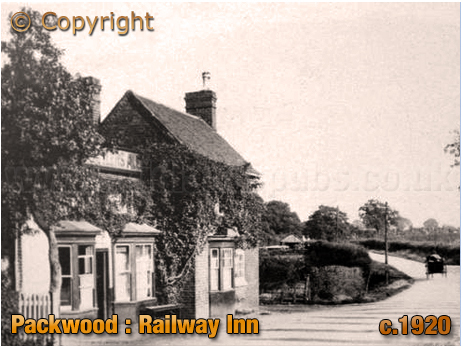 History of the Railway Inn at Packwood in the county of Warwickshire. This pub has been known as the Railway Inn in more recent times but in the 19th century the house was generally called the Railway Tavern. 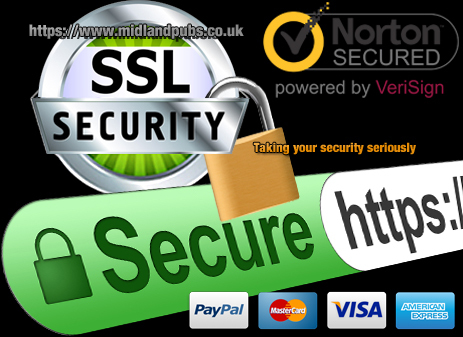 It is regarded as a pub in Dorridge because that settlement has slowly expanded over the years. Indeed, Dorridge Village Hall is very close to the building and those wielding a bat at Dorridge Cricket Club could easily hit the pub with a well-driven shot. 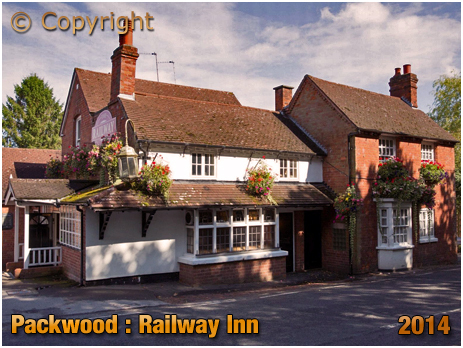 However, the Railway Tavern was a pub in the parish of Packwood. There was one other pub in the parish as the Nag's Head at Hockley Heath was inside the boundary. 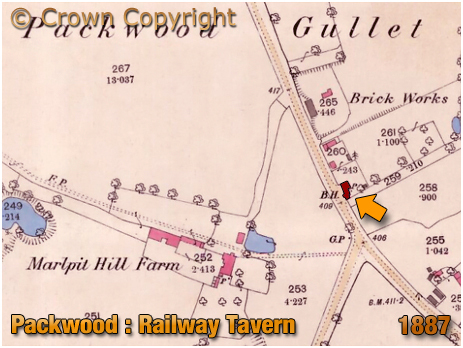 The Railway Tavern can be seen on this extract from a map published in 1887. Marlpit Hill Farm is to the west of the Railway Tavern. In the 21st century bowling greens stand on the site of the brick works seen here next to the tavern. A large sand pit was also excavated to the east of the pub on a site just on the other side of Grange Road, a short stub of a road next to the tavern. At the time of this map the road heading north-west led to Packwood Grange, a large residence occupied by the retired barrister and brassfounder Edmond Tonks. Marlpit Hill Farm was operated by Edward and Fanny Tallis. The Railway Tavern was originally a beer house. Indeed, it would remain as such until a full licence was finally obtained in 1960. The boozer was a very simple affair when it was run by John Gazy, a cordwainer [shoe maker] and beer retailer in the mid-19th century. He was born in Packwood and, despite running a house named after a modern transport mode, possibly didn't venture much beyond the parish boundary. Dorridge was not up to much before the arrival of the railway. It was just a scattering of farm buildings and cottages. The Muntz family of Umberslade Hall owned much of the land and only sold to the railway on the proviso that a station or halt be built at Dorridge for their convenience. Consequently, a village grew around the station which facilitated early commuter lifestyles for those who could afford it. Built by the Great Western Railway, a station was opened for passengers on October 1st, 1852. 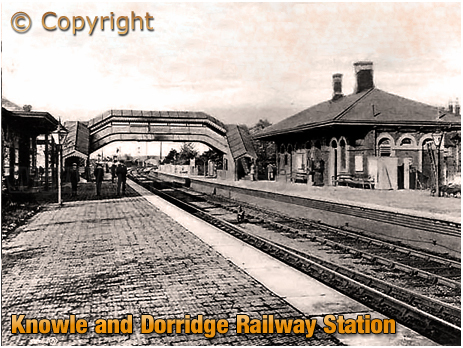 It was originally called Knowle Railway Station but was changed to Knowle and Dorridge in July 1899. The station's name was shortened to Dorridge in May 1974. Spotting an opportunity to diversify his business as a cordwainer, John Gazy added publican to his job title when the railway track was being laid. No doubt the navvies working on the track bed provided an initial boom in trade. John Gazy kept the Railway Tavern with his wife Ann. Until a licence was granted for the newly-constructed Forest Hotel opposite the railway station in the 1860s, John and Ann Gazy could boast they were the convenient house for the station. Eliza James had first married John Gazy at the Parish Church of Saint Giles on October 25th, 1831. He was the son of Samuel and Julietta Gazy. A carpenter by trade, Samuel Gazy served as Clerk of the Parish. In the early 1840s John and Eliza Gazy occupied their house with daughters Ann and Amelia. Also living on the premises was young Thomas Satchwell who was apprenticed to John Gazy as a cordwainer. By 1851 John Gazy was recorded as a master cordwainer. His expertise possibly meant that he provided most of the shoes and boots to the residents of the parish. Following the death of Eliza, John Gazy married again, in February 1846, to the widow Ann Bishop. She was the daughter of the farmer Thomas Arculus. The couple added to the children from their previous marriages. John and Ann Bishop kept the Railway Tavern for many years, growing the business and adding a provisions shop. John Gazy died in 1875 and the licence of the Railway Tavern passed to George Gardiner. The Wellesbourne-born monumental mason had married daughter Eliza Gazey in June of the previous year. George Gardiner had followed in his father's footsteps by becoming a stone mason. He continued in this field and probably left the running of the shop and Railway Tavern to his wife Eliza who had grown up on the premises and worked in the business. George Gardiner was still licensee of the beer house in 1878 as he appeared in the Leamington Spa Courier in an article that stated the licensee of the Railway Tavern, Packwood, charged Henry Millett, blacksmith, Shirley, with furiously driving along the Stratford Road at a place called Madam's Hill, on May 4th 1878, at half-past 10 at night. In court the publican stated that he and his friends, Brookes, West and Swinbird, had been practising ringing the Shirley Church bells, and on returning in a light pony trap, they met Millett driving at the rate of twelve miles an hour. George Gardiner called out look-up, as he knew Millett was on the wrong side of the road. A collision took place, Gardiner and his friends were thrown out, and Millett and his horse were severely injured. On hearing the evidence however, the Magistrates fined both parties 18s. each, suggesting that they regarded both men to be responsible - or irresponsible! By 1880 Charles Wood was running the Railway Tavern and attached grocery shop as he appeared in front of the magistrates in October of that year for serving short or light measure of goods in the shop. One offence was for 5lbs. suggesting he was rather a rogue. The previous incumbents had moved to a property across the parish boundary in Knowle. In the 1881 census they are recorded at a house in Station Road, close to the Vine Inn, a public house run by John Rudd. George was still working as a stone mason whilst Eliza had taken up dressmaking. Ann Gazy, widow of the early publican of the Railway Tavern moved into the property to live with them. She died in December 1894, aged 78. George Gardiner remained a monumental mason for the rest of his career. By the end of the Victorian period he had a good business based near the railway station. Living nearby, George and Eliza Gardiner may have called into the old place to see how things were. Their successor, Charles Wood, was recorded as a wireworker and beer retailer. Born at Hockley Heath around 1827, he kept the Railway Tavern with his wife Catherine who hailed from Sutton Coldfield. In his early years Charles Wood had, like his father before him, worked as a cordwainer. He would have found some of the workshop leftovers of former publican John Gazy a fond reminder of his youth. Following his marriage, he had moved to Hay Mills where he first started in the metal trade. He and Catherine had three sons and two daughters before the they moved to Packwood to run the Railway Tavern. Their son James was a butcher and shopkeeper so it was probably him that sold underweight meat for which his father, as licensee, took the rap. Charles may have made enough money in the metal trade to take things easy for he and Catherine moved to Rose Cottage on Union Road at Shirley, where he was recorded as a retired manufacturer. 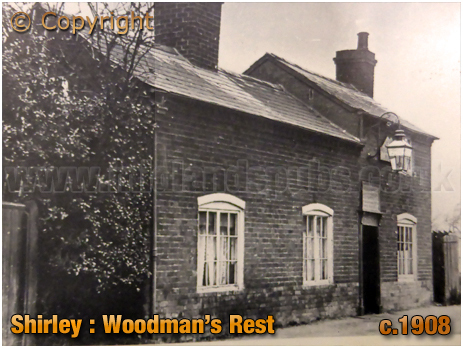 Their cottage was next to the original Woodman's Rest, a pub run by the Wood family. Also a butcher by trade, John James Wainwright was publican in the late 1880s. He was unusual in that he was born in New York in the United States but was baptised a year later when his family lived in Aston. He married Mary Ann Jane Brookes in 1853 at the Church of Saint Peter and Saint Paul at Aston. What they had in common at the time was that both of their fathers were die-sinkers in Duddeston. Mary Ann was born in Chatham in Kent so it would appear that both families had migrated to Birmingham for economic reasons. John Wainwright had been engaged at a provisions shop a few years before his marriage. At that time he was lodging, and perhaps working part-time, at a pub in Edmund Street, a combination that would stand him in good stead at the Railway Tavern in future years. In the early 1860s John was working as a warehouseman whilst the couple lived at Northfield. A decade later they were back in the town and operating a tripe shop in William Street. Hardly eaten in Britain these days, tripe was once a popular dish from Victorian times until the post-war years. It was regarded as tasty, cheap and a good source of nourishment. My only recollection of tripe, along with lights, was my mother boiling them for our dog - and how it used to make the kitchen stink. Mind you, whilst it was cooking our boxer would be drooling to death in anticipation! Anyway, I digress .... John and Mary Ann's shop did well and they able to employ Martha Kent as a servant to help in the business. Following their spell at the Railway Tavern, they operated a butcher's shop in the shadow of St. Agatha's Church at Sparkbrook before moving to a more lucrative position on the Alcester Road in King's Heath. John and Elizabeth Glover kept the Railway Tavern in the early 1890s. They were assisted by their son and daughter, also named John and Elizabeth, along with two domestic servants, Annie Timms and Henry Bishop. This would suggest that trade was good. The shop took on a new dimension at this stage because John Glover was a baker. The family had, for many years, previously run a bakery in Sherlock Street in Birmingham. The smell of freshly-baked bread would have been wafting around the premises during their spell here at Packwood. Couples running the Railway Tavern at the end of the 19th century seemed to only stay for a few years. At the turn of the 20th century the house was kept by Daniel Lindon. He and his wife Charlotte were living near the pub when it was kept by the aforementioned Glover family. He was working as a gardener, possibly on the estate at Packwood House. The couple had a dabble at running a pub but, as so many people who move from one side of the counter to the other, they find that it is a completely different experience to that of patron. They soon departed, perhaps to what they viewed as a better opportunity, for they moved into Washpits Farm across the parish boundary at Knowle. Daniel and Charlotte Lindon were succeeded by Matthew and Mirah Stafford. He had grown up in Ladywood in Birmingham. He was serving an apprenticeship as a cooper but absconded from his employer Jabez Marshall who promptly placed a notice in the Birmingham press warning other employers not to take him on. He was determined to punish Matthew Stafford and had a warrant for his apprehension. This may seem to be a rather draconian measure but was general practice during the Victorian era, a time when a master was allowed to administer reasonable corporal chastisement to his apprentice. Moreover, if any apprentice, whose premium had not exceeded 19, ran away from his master, "he could be compelled to serve beyond his term for the time which he absented himself, or make suitable satisfaction, or be imprisoned for three months." Employers would take heed of such notices in the press because it they took the person on the master was entitled to his earnings, and he would be within the law to bring an action against the persons who employed them. Matthew Stafford must have knuckled down as he was still working as a cooper when he married Mirah Woodbridge at St. John's Church at Ladywood in January 1873. He continued as a cooper for many years but eventually got itchy feet and became a boatman. His son Arthur went with him on the boat but the rest of the family remained in dry dock at Ladywood. Matthew and Mirah went into the licensed trade by taking over the Why Not Inn, a beer house in Osler Street. That property was operated by Mitchell's and Butler's and is the link to their relocation to Packwood which was possibly an inter-company move. The Cape Hill-based brewery had taken a 25-year lease on the Railway Tavern on April 11th 1900. Mitchell's and Butler's leased the property from John James, initially paying £55 per annum. The freeholder, John Jesse James lived with his wife Ann in the parish in Manor Road at a house called Dinedor. The Herefordshire-born manufacturer, owner of a brass foundry, had possibly acquired property and parcels of land in the locality as investments. He was elected as a member of the Solihull Rural Council and Board of Guardians. Matthew and Mirah Stafford were middle-aged when they took over at the Railway Tavern by which time their children had all flown the nest. They did however employ Lucy Brampton as a live-in servant. Whether they did not settle is not clear but by the mid-Edwardian period they moved back to Birmingham to run the Turk's Head on Ladywood Road, another house operated by M&B. Joseph and Emily Bullock kept the Railway Tavern for much of the Edwardian period. They lived at the pub with three children, Florence, Beatrice and George. Their niece Nellie Fowler also stayed here whilst working as a maid. In March 1914, Norman Woods died when cycling close to the Railway Tavern at night. It was about 10 o'clock on a Saturday evening when he collided with a pedestrian just yards from the house. A report stated that "Norman Percy Woods, a 23 year-old jobbing gardener from Bentley Heath, was cycling in the direction of Knowle, collided with a pedestrian named Sanford, who was walking with another man, also in the direction of Knowle." Norman Woods was thrown off his machine and rendered unconscious, and Sanford was also insensible when picked up. It was seen that the cyclist had suffered a serious injury so a passing car was flagged down to convey him to Knowle, where Dr. Hollick advised his immediate removal to the hospital at Birmingbam. Before reaching Solihull, however, the man had breathed his last, and the body was removed the mortuary at Solihull. The only external sign of injury was a small punctured wound in the back of the head. It was stated that "Woods had a good light on his machine, but the road where the accident occurred was a dark one, and had several bends." There were a couple of interesting caveats within the lease agreement of 1900 between John Jesse James and Mitchell's and Butler's. 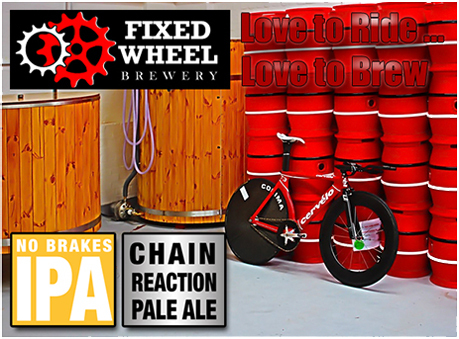 Firstly, there was a covenant by the brewery to finish alterations approved by the Justices within a year of taking over the lease, suggesting that changes to the internal structure and arrangements had been enforced under tighter legislation. There was a second covenant in which Mitchell's and Butler's agreed to pay the lessor 5% on amounts over £50 spent by him on structural alterations. 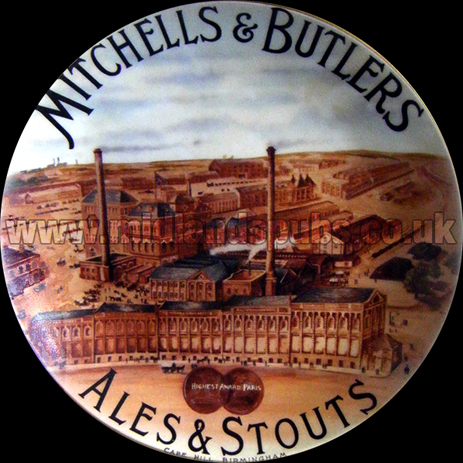 Paying £300 to John James, the brewery renewed the lease in September 1922 for a term to run until September 29th 1949. With regard to the water supply, the company also agreed to pay the Corporation of Coventry one-tenth of the cost of laying their main past the railway, payment to be made annually until April 1935. It is unusual for a brewery to agree to such conditions and is a sign of how much they wanted to have a presence here in Packwood They renewed the lease again before the end of the term, taking their arrangement up to September 1959. Thomas Watson arrived as tenant of the Railway Tavern on July 26th 1915 and this marked the beginning of an epoch for the house. The Watson family would remain at the helm for over a century. Spending £62.1s.6d. on fittings, Thomas agreed to pay an annual rent of £74.2s. per annum which, for the time, was not excessive. The son of farmers William Watson and Mary Ann Edwards, Thomas Watson was born at Pillerton Hersey in October 1889. His formative years were spent at Mews Farm but he grew up at Lane Farm when the family moved to Hatton. Along with his brother and sisters, he worked on the farm before forging his own career path. He married Florence Whitehead in July 1915, the Railway Tavern becoming their first home. Florence was the youngest daughter of Sam and Mary Whitehead who kept the New Inn at Rowington. The couple had two children, Joan and Eric, before Fanny tragically died of pneumonia at the Railway Inn during March 1919. Thomas Watson married again in 1923 to Adeline Pargeter. She also had a background of farming. Together, they would run the Railway Inn for three and a half decades. They had four children - Lynne, Ron, Joy and Leonard. In the 1930s, Thomas and Adeline would shift around 160 barrels of beer per annum, a figure that dipped slightly when the war was imminent. However, during the early years of the conflict sales rose dramatically and the Railway Inn was turning over significantly more beer - in 1943 and 1944 the pub dispensed more than 340 barrels of beer. Thomas and Adeline Watson both passed away in 1959, the licence of the pub being transferred to son Eric who in his early years worked as a butcher's slaughterman. One of his tasks when taking over the pub was to obtain a full licence for the property [see above] as up until this point the Railway Inn only had a beer and wine licence. 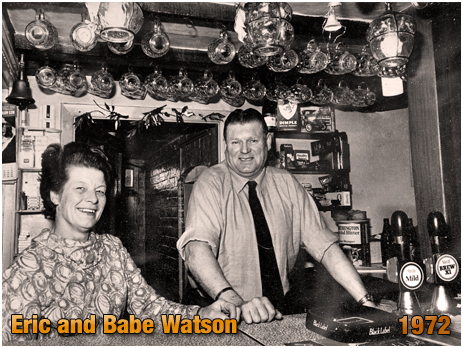 Running the Railway Inn with his wife Babe, he was licensee until 1982 when son Joe picked up the torch to continue the family tradition of running this popular tavern. Joe Watson, along with his wife Janet and daughter Becky have maintained the popularity of the Railway Inn. 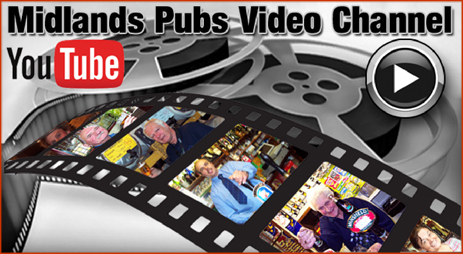 With them at the helm, the pub has in the past won the Solihull CAMRA Pub of the Year. "A landlord whose family has run the same pub for 100 years has no plans to call time on the tradition. Joe Watson, 66, is the third generation of his family to be landlord of the Railway Inn in Dorridge. His granddad Thomas Watson took over the pub in 1915, passing it to son Eric in 1959. In 1982, Eric passed it to Joe, who hopes to hand it on to daughter Becky Neal, 38. Joe said: "I think the secret is you've got to want to do it. You can't take it on for the money - it's not your job, it's your way of life. "You have to change with the times, but not too much because it's a very conservative industry. Dorridge has got bigger and a bit more affluent over the last century, but the key ingredients to a well-run pub haven't changed. You've got to keep it simple - we don't have any slot machines or music on, just regular customers, good food and good beer. Most of the customers have known our family all through our time here, while others come from miles away too, but we treat them all the same." Joe and Janet's daughter Becky has worked with her parents since she was 17. 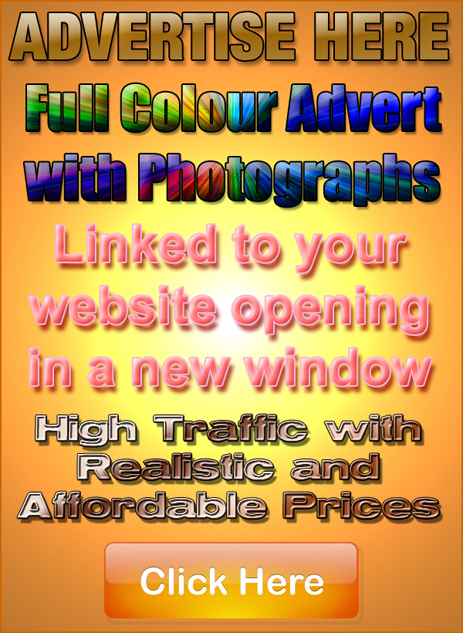 Landlord Joe added: "Becky's got all the qualifications and it's all she's ever known. She doesn't live here with us, but it would be great if she took it on when we've had enough. I would never force anyone to do it though, you've got to want to and I think she really does." Becky, who has two daughters, Megan, five, and Ruby, three, said: "Many of our customers are families who have known our family through the generations. 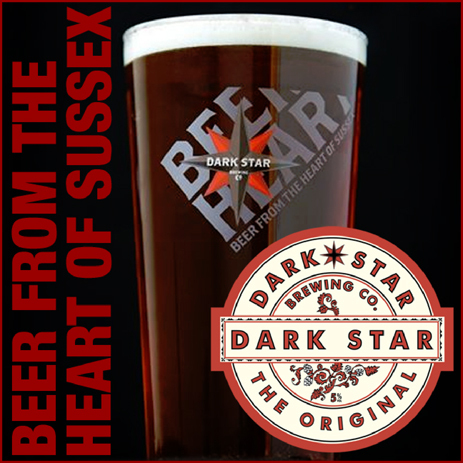 We are really proud of the pub and our family's history." "Pub landlord whose family has run same boozer for 100 years reveals secret to longevity"
If you have a genealogy story or query regarding the Railway Inn you can contact me and I will post it here in addition to including your message within the website pages for Warwickshire Genealogy. If you would like to share any further information on the Railway Inn - perhaps you drank here in the past? Or maybe knew a previous publican? Whatever the reason it would be great to hear of your stories or gossip. Simply send a message and I will post it here.